What is the Ferric Chloride Facility? Southwest of Spring Lake sits a small yellow building that guards a particular wetland along Highway 13. Many local residents may not know that this facility and the system connected to it help to clean water before it flows into Spring Lake. This mystery facility is called the Highway 13 Ferric Chloride Facility, and it has been helping to reduce pollutant levels in Spring Lake for almost 15 years. The Prior Lake-Spring Lake Watershed District (District) originally installed the Ferric Chloride Facility in 1998. 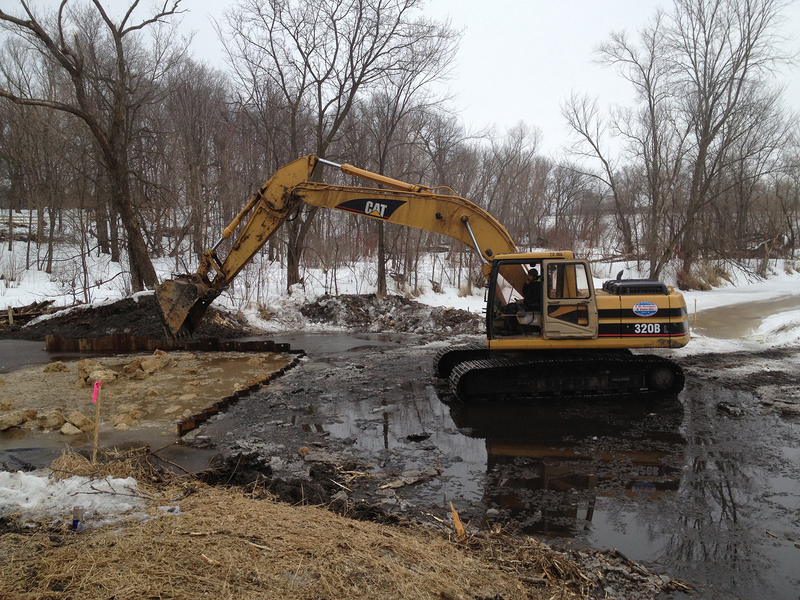 Last year, the District finished updating the Ferric Chloride Facility to meet new Minnesota Pollution Control Agency requirements, and increased the capacity of the system to treat water flowing through the area. Some of the key improvements to the system included upgrades to the line that adds the ferric chloride solution to the water and a bypass that will allow the system to continue to remove phosphorus when a lot of water is trying to move through the wetland to Spring Lake. Excess water, also known as runoff, from melting snow and rainwater in this area generally flows from the southwest to the northeast as it funnels through the County Ditch 13 system toward Spring Lake. As this runoff flows through the Ferric Chloride system, the facility injects liquid ferric chloride into the water at a controlled rate in a specially built pond area called a desiltation pond. Here the ferric chloride chemical attaches to the phosphorus in the water, then forms a solid material and falls to the bottom of the pond. This process “cleans” the water by removing phosphorus as it continues to flow into Spring Lake. Removing phosphorus from the water before it reaches Spring Lake is important because Spring Lake already has too much phosphorus. Phosphorus is a nutrient that is important for animal and plant life in lake ecosystems, but too much phosphorus in the water can cause a chain reaction of undesirable events. If there is an excessive amount of phosphorus available in the water, this pollutant can promote harmful algal blooms that cause fish kills and interfere with swimming, fishing and boating. Recent testing has shown that the Ferric Chloride Facility provides an estimated removal of 35% of the Total Phosphorus coming from the County Ditch 13 system. This essentially prevents an average of more than 500 pounds phosphorus from entering Spring Lake each year. And just one pound of phosphorus can produce 500 pounds of algae! The system is expected to be active this spring, and will continue to remove phosphorus from the water before it enters Spring Lake. The FeCl Facility is Back In Action! Earlier this spring, the District organized the modification of the ferric chloride facility to meet new Minnesota Pollution Control Agency requirements, and increase the capacity of the system to provide treatment. The system is now actively running and helping to reduce some of the phosphorus from entering Spring Lake. In March 2013, a crew started to construct the high-flow bypass. Some of the key improvements to the system included upgrades to the ferric chloride feed line and a high-flow bypass that will allow the system to continue to remove phosphorus during very high flow events. 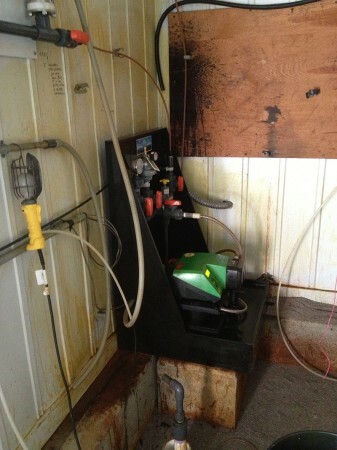 A picture of the new chemical feed pump inside the FeCl facility. Recent testing has shown that the system, both the FeCl3 injection system and the downstream desiltation basin combined, provides an estimated removal of 35% of the Total Phosphorus (TP) from the County Ditch 13 system. This equates to preventing an average of more than 500 pounds per year of phosphorus from entering Spring Lake, which is impaired for excessive nutrients. Just this week the PLSLWD began work on updating our Ferric Chloride facility. Among the improvements to be installed are a high-flow bypass, so that the system can continue to remove phosphorus even in very high flow events, a new feed line that goes directly to the basin where sediment is removed, and a new pump. All together these improvements will make the system more efficient and effective. So far we have cleared ground, surveyed, and installed a weir. We’ll keep posting as new an exciting things happen. Be sure to give us a call if you have any questions about the project.